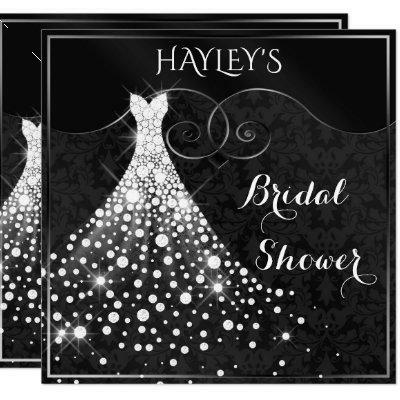 Elegant, glamorous black, white and silver Bridal Shower invitations with a beautiful sparkling diamonds white wedding gown on a chic black damask pattern background with sophisticated silver swirls and flourishes and a pretty silver border. Classy, trendy, feminine, sophisticated, modern invites. All of the text can be easily customized to meet your needs and you can change the font style, color and size of font if you desire. If you need any assistance customizing your product please contact me through my store and I will be happy to help. PLEASE NOTE: These are flat printed graphics - no raised parts.